In a large saucepan or small stockpot over medium-high heat, melt butter. Add shallots and cook, stirring occasionally, until lightly browned, about 5 minutes; stir in broth and bell peppers. Bring to a boil over high heat, reduce to a simmer and cook, stirring occasionally, for 20 minutes. Using a food processor, blender or immersion blender, carefully puree soup; return soup to the pot and stir in parsley and 1 1/2 cups mascarpone. If necessary, gently reheat. Add cayenne pepper and salt to taste; add more broth or mascarpone to reach desired consistency. 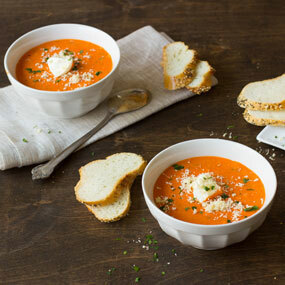 Serve soup garnished with Dry Jack and 6 tablespoons mascarpone. Tip: Ideally use peppers jarred without vinegar.